Please bear in mind that there is a possibility that laws can be updated and changed, as average local temperatures fluctuate, so we recommend you double-check local laws before you take a trip abroad in winter. For example, in the UK large parts of the country rarely experience prolonged periods of extreme cold and, when it does happen, most drivers simply choose not to drive. It wouldn’t make economical sense to make winter tyres mandatory. Albania Winter tyres are not mandatory. Between 1st November and 30th April it is compulsory to carry snow chains. Winter tyres are not mandatory. Snow chains are permitted. Croatia In sleet, snow and ice, at least two winter type tyres must fitted to the drive axle. Snow chains and a shovel must be carried. Cyprus Winter tyres are recommended. Denmark Winter or all-season tyres recommended. Snow chains are permitted. France As a general rule, the fitting of winter tyres is not mandatory. However, in certain mountainous regions, winter tyres are necessary. Snow chains may be permitted as an alternative. Germany Regulations brought in in 2010 require all passenger cars and motorbikes to be fitted with winter tyres or all season tyres on all axles in wintry conditions. Snow chains should be carried. Greece Winter tyres are not compulsory but tyres must be appropriate for winter conditions. Snow chains are permitted. Hungary Winter tyres are not mandatory but you must carry snow chains with you in case driving conditions deteriorate. Portugal Winter tyres are not compulsory but snow chains are mandatory where signage indicates. Russia Winter tyres are mandatory and snow chains must be carried. Slovakia Winter tyres are not compulsory but tyres carrying the M&S symbol must be used when compacted snow or ice is on the road. Spain The use of winter tyres in Spain is regional. Look out for traffic signs indicating that winter tyres or snow chains are compulsory in that area. Sweden Winter tyres are mandatory. Snow chains are recommended 1st December to 31st March Tyres must feature M&S symbol and have a minimum tread depth of 3mm. Switzerland Winter tyres are not compulsory across the whole country but tyres must be appropriate for winter conditions Look out for traffic signs indicating where winter tyres or snow chains are mandatory. Turkey Winter tyres are not mandatory. Snow chains must be carried in certain areas. 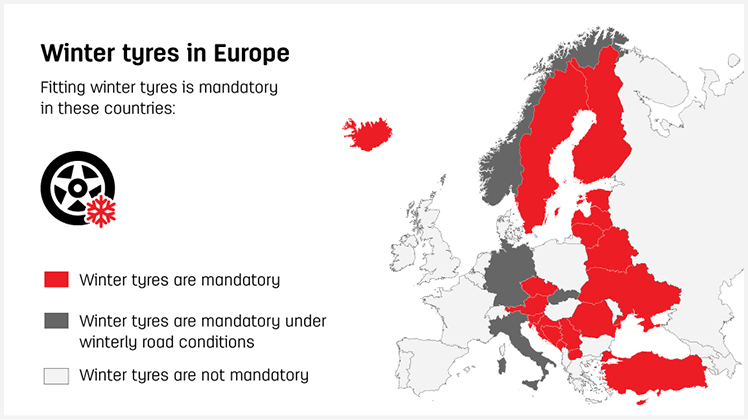 Ukraine Winter tyres are not mandatory.